For more than a decade, restaurateurs Leslie and Jean-Jacques Bernat have served up Southern French cuisine at their bistro Provence en Boite. 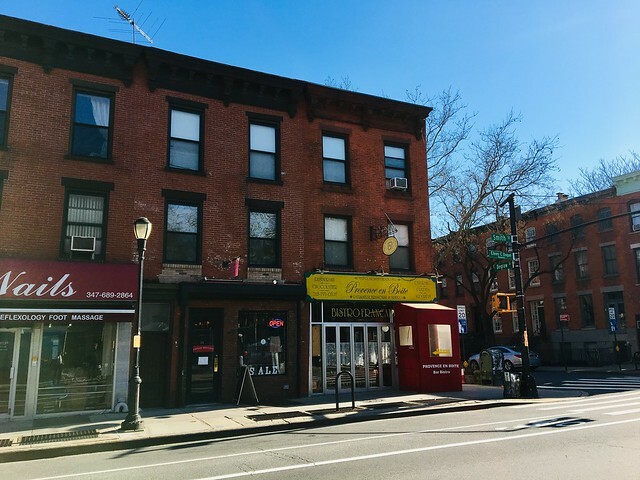 Located at 263 Smith Street at the corner of DeGraw Street, the cheerful eatery with its outdoor seating area is a popular spot amongst locals for brunch, to watch a soccer game, especially during the World Championship, or as a hangout during Smith Street's annual Bastille Day celebration. Besides the usual bistro fare Jean-Jacques bakes fresh croissants, pains au chocolat, tartes and assorted other patisseries, as well as galettes for the Three Kings Day celebration in January. 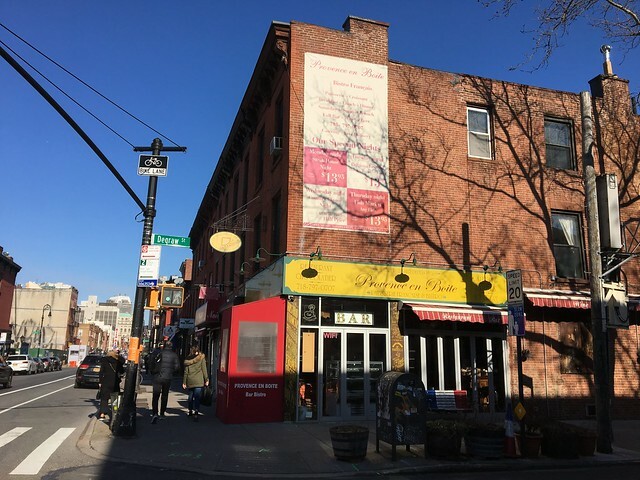 "Provence en Boîte has been shuttered for “operating without a license “. The notice sticker is on the inner door." We walked by to check it out this past Saturday and the restaurant was closed during brunch hour. We returned this morning and found that the place is still closed, though its web site states that it should be open on a Monday. 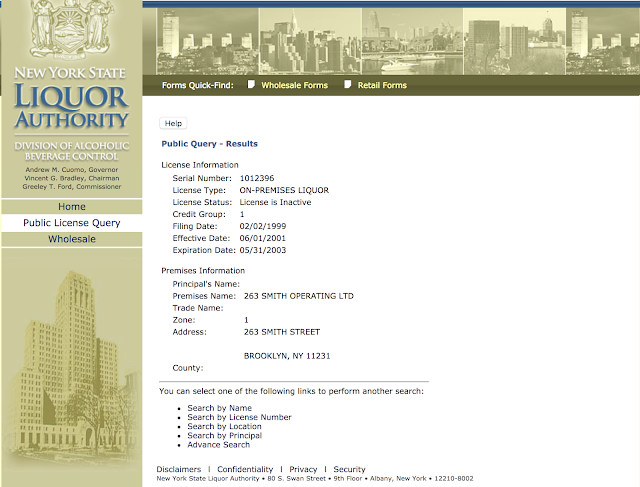 The sign regarding the liquor license has been removed, but a quick search on the the New York State Liquor Authority's web site indicates that it had been inactive for a while. Strangely, we noticed that a new entity named "Catrinas on Smith" was scheduled to make a presentation in front of CB6's Permits and Licenses Committee back in October 2018 for a new on-premise liquor license, but the representatives never showed up that night. It would not be the first time that Provence en Boite is shut by authorities. Back in 2009, the eatery was closed for a few days by the the Department Of Consumer Affairs because of a problem with their outdoor seating area. 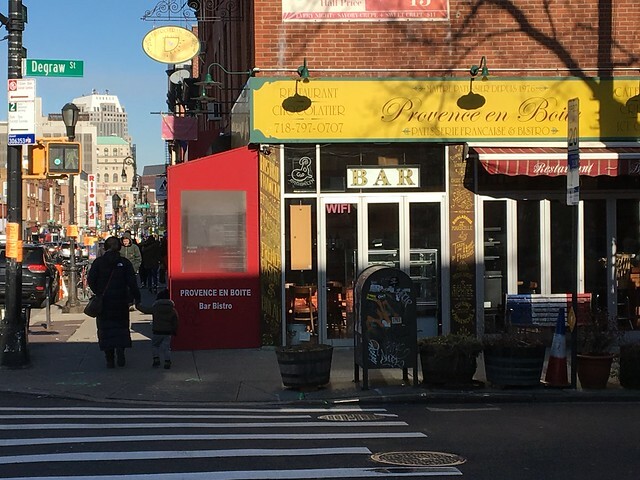 No word yet if the restaurant will reopen, if this is the end for Provence en Boite, or if a new business named Catrinas will be opening in that spot. Do you have any thought or further information? 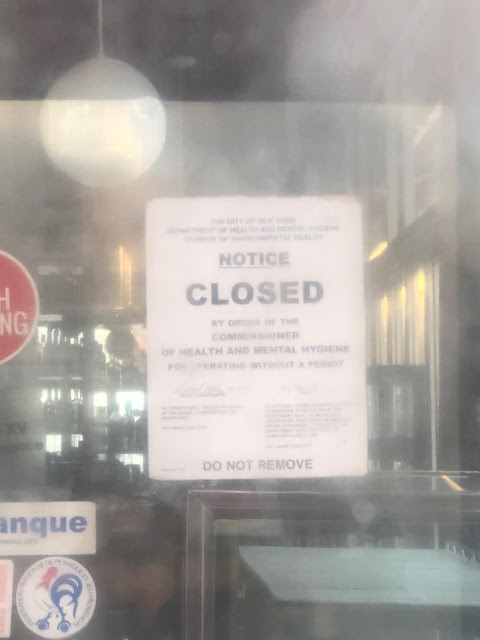 Reader Gordon just sent us a photo of the notice that was taped on the restaurant's window last week. It appears to be from the Department of Health and Human Services. Smith Street is really in bad shape. And now we have the Racist / Homophobic Nature's Grill to look forward to! I know was posted on here a few weeks ago. But look at this recent Instagram post from the owner. Judging by his instagram feed, the owner of Nature’s Grill is indeed a bigot. How disappointing. I’ll gladly continue to order from Fatoosh BBQ. The couple have always been nice. I had brunch there only a few times yrs ago. In my NIMBY opinion the best brunch was Banania. RIP Banania. :( but the croissants and pastries are always correct and flaky. And served in a thin paper French pastry bags. I remember they tried that hamburger place which bombed. And I also remember when Provence et Boit only took cash. I would hope they will not vanish. And if they downsize, please keep the baked goods. As far as the Nature’s Grille racist guy? They have already draped the dreaded plastic sign announcing their arrival. As I’ve said before They will have a hard time finding waitstaff. Please readers do not go there. I’m sad Smith has become a hodgepodge of nail salons and hit or miss cafes and big money chain stores like MAC. MAC also tests on animals. :( anyway. I digress. Let’s hope Provence et Boite recovers. thanks for the tip on the owner of Natures Grill IG....hard to believe this guy is bringing his BS to our lovely neighborhood. I will not be spending my money there. Hadn't eaten at Nature's Grill ever before, and certainly never will, now. TY for the info. Oh my god. I will never, ever set foot in that place. I'm not tech savvy, but someone should archive this bigots posts before he deletes them. Amazing that such an intolerant person would be operating a business in a neighborhood that is so progressive. Contrast him w the owner's of Emma's Torch on the same street. The nature’s grille guy also posts about his children. If they only knew. It’s such a strange mix of pride and ignorance. 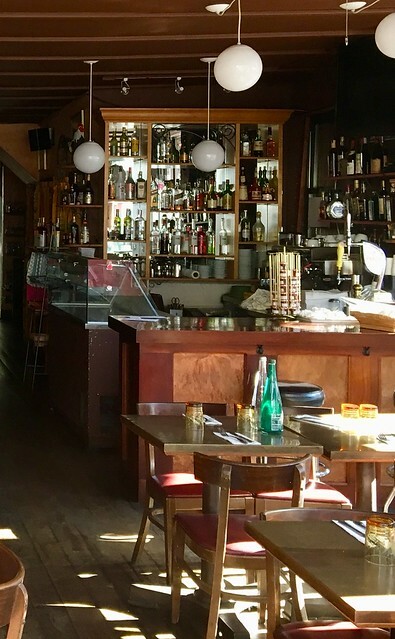 An auctioneer was at Provence en Boite on Wednesday, January 30, clearing out the contents. The place has been dwindling into oblivion for some time, with very erratic hours and not too many fresh-baked goods available. The business was clearly not viable for some time as there were almost no customers and therefore no revenue. 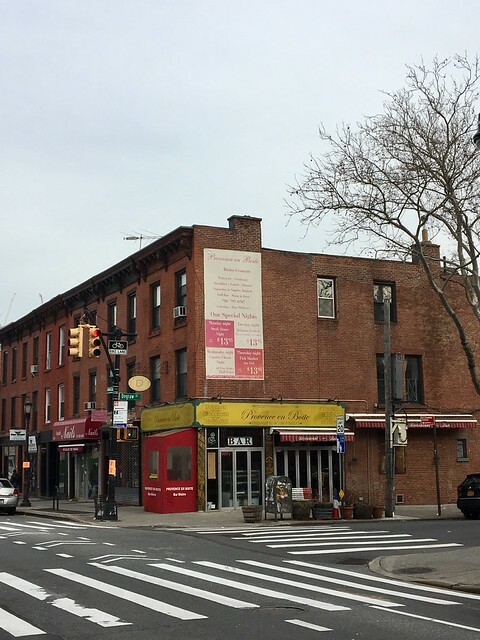 As a resident of DeGraw Street between Smith and Hoyt, I hope a new business moves in soon. I was no fan of P en B, though, as their Bastille Day Celebration was a massive intrusion on a residential street for the benefit of a private business. Au Revior. Was walking by earlier this afternoon and saw the interior is being cleared. The female owner was sitting and checking her phone. I asked thru the window if they were going to reopen and gave me a negative shake of her head and a sad smile. * and, well, the owner concedes that being vocal supporters of Donald Trump probably didn't win them new friends in the neighborhood. I will miss the place, even though I wasn't buying the delicious pastries there anymore since they had sold me a "guaranteed nut-free" as in "I baked it myself and swear it's nut-free!" cake that had me rush my allergic child to urgent care. Other friends have stories of prices fluctuating and other tales that were adding up. While the restaurant had many qualities, the writing was on the wall, unfortunately. Dimitrios Verteouris, the co-owner of Nature's Grill and author of said Instagram account has wisely set it to private, rendering it inaccessible. Might anyone have taken screenshots of his toxic posts?